This has always been a problem in the manufacturing world — companies selecting equipment that is “biggest, fastest, and cheapest” (or at least “cheapest” in terms of unit cost). To be cheapest, the machine usually has a giant batch size, so the expensive machine's cost is spread out across a large batch. The temptation is there to run the machine to spread out costs across many batches, even if demand isn't there. That's the non-lean manufacturing world, the mass production world. Lean teaches us to right size our batches. Smaller batches means shorter cycle times, whether in a factory or in a hospital laboratory. Hospital labs, pre-lean, usually have large centrifuges that run giant batches (up to 80 tubes, in some cases). These centrifuges take up a lot of space and there is a strong temptation to let a batch accumulate before pressing the “start” button. At the left, we see a typical large batch centrifuge. A centrifuge that holds 24 tubes currently costs about $1600. Even with 24 tubes per batch, the centrifuge isn't fully utilized. Tubes wait either for a batch to accumulate, or they wait because a batch is already going (which takes 6 minutes). To the left is a “StatSpin” centrifuge that holds only 8 tubes. It costs more ($2100), I suppose because the smaller motor is more expensive. I wish I had photos of them side by side, the StatSpin is much smaller. Not only is the smaller one more expensive, but you need two of them. On a purely cost-driven basis, this would be a dumb decision. But, with lean thinking, you consider the whole picture. The two small centrifuges take up less space than one big one, and hospital real estate is valuable. You can also run smaller batches, which means faster cycle times and faster test results. The smaller centrifuge also runs faster (don't ask me to explain the physics of it), in about 3 minutes. Oh, of course, the quality of the “spin” is just as good (it would be or we wouldn't have been able to consider them). 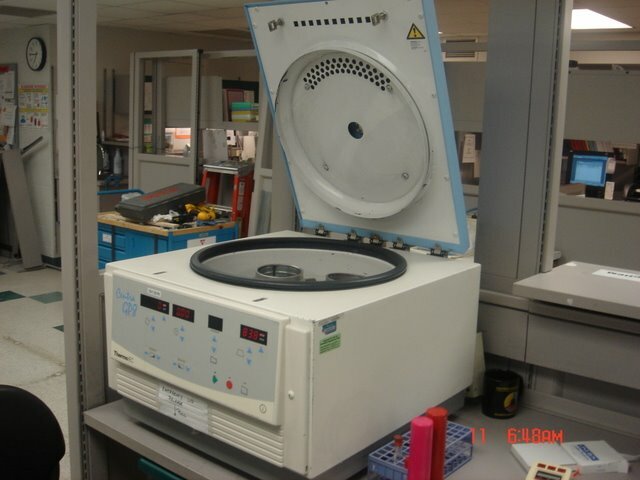 Lean labs are moving overwhelmingly to the smaller centrifuges. Centrifuge makers are adapting and offering more small batch options. You're moving in the direction of one piece flow, at least, even if you're not completely there. 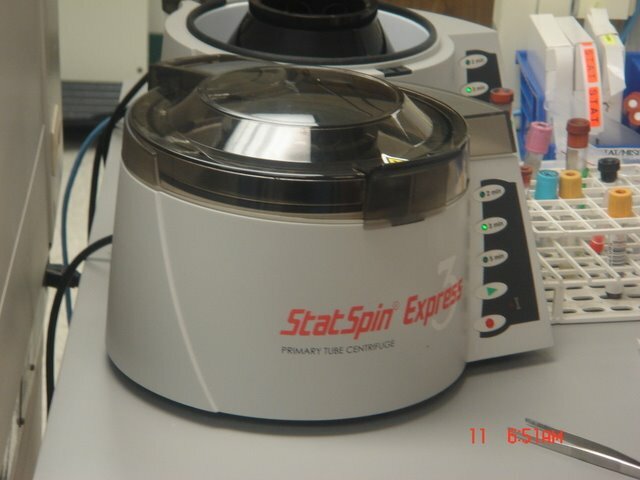 Don't ask for a true “single piece” centrifuge, as it would be out of balance! I wanted to share this for the factory folks — people in healthcare struggle with many of the same decisions you do. Looking at tradeoffs of cost and cycle time, you have to make the decision that's right for the whole big picture, not just the limited view of unit cost.